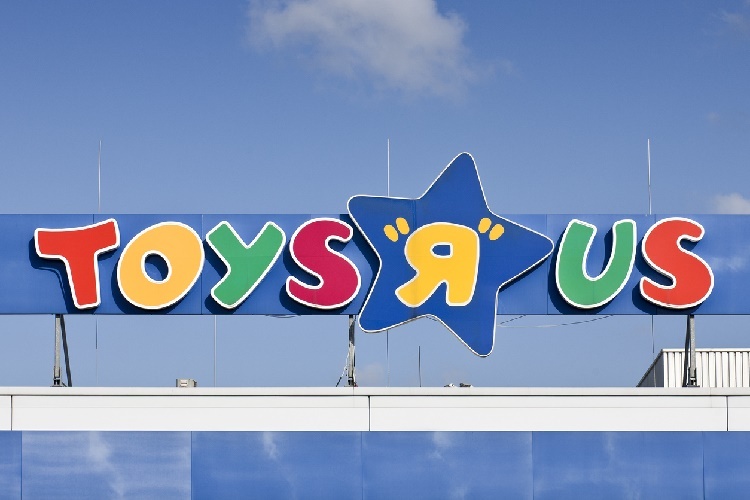 Retail giant Toys “R” Us filed for voluntary Chapter 11 bankruptcy protection in the US and Canada this week, and the news furthered the popular narrative of a “retail apocalypse” in the US. The bankruptcy proceedings do not affect the company’s operations outside the US and Canada. Comparable sales in the US market were down 2.3% in the fourth quarter of fiscal 2016 (which included the crucial holiday period), due to poor sales in the entertainment and baby categories. However, the group operating margin stood at 10.3% in the quarter, up from 9.2% one year earlier. In the first quarter of fiscal 2017 (latest), performance worsened, with domestic comps down 6.2%. Group operating losses deepened significantly, to $54 million from $7 million a year earlier. In both quarters, the company’s international business performed better than its US operations, with positive sales growth noted in the Asia-Pacific region in the first quarter of fiscal 2017. Toys “R” Us noted this week that the vast majority of its stores remain profitable, and that its stores will remain open during the bankruptcy proceedings. Management stated that the objective of this filing is to restructure the company’s $5 billion of long-term debt in order to provide Toys “R” Us with “greater financial flexibility to invest” in its business. “This debt has held us back from making the investments we need to compete effectively in what has become an increasingly challenging and rapidly changing retail marketplace,” CEO Dave Brandon noted. As of April 29, 2017, Toys “R” Us had long-term debt on its balance sheet totaling more than $5.2 billion, $444 million of which is due next year. Much of the debt is the legacy of a $6.6 billion leveraged buyout, led by Bain Capital, KKR Group and Vornado Realty Trust, back in 2005. Like most brick-and-mortar retailers, Toys “R” Us has faced heightened competition from Amazon. 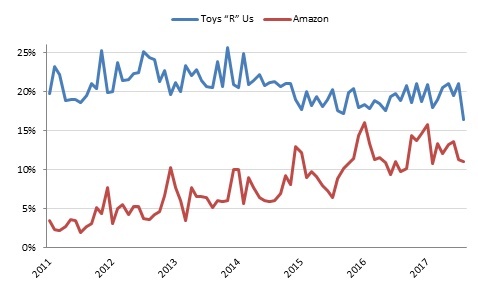 Survey data from Prosper Insights & Analytics, charted below, show a steady increase in the number of mothers with young children who rate Amazon as the store they shop most often for toys. By this measure, Toys “R” Us has seen some softening over the medium term. Back in 2013, between one-quarter and one-fifth of such mothers said Toys “R” Us was where they shopped most often for toys, and the lowest level recorded in Prosper’s monthly surveys that year was 20.0%. As of this year, however, that rate has dropped to between one-sixth and one-fifth of mothers with young children, and it reached a low of 16.4% in August (latest). Toys “R” Us’s move looks to have been driven by the pressures exerted by such competition: the company’s communications this week have stressed that Toys “R” Us needs to invest in its business in order to improve its proposition and strengthen its competitive position. So, even if a loss of customers to Amazon has not directly caused these bankruptcy proceedings, the pressures of competing with the Internet giant look to have prompted the filing indirectly.